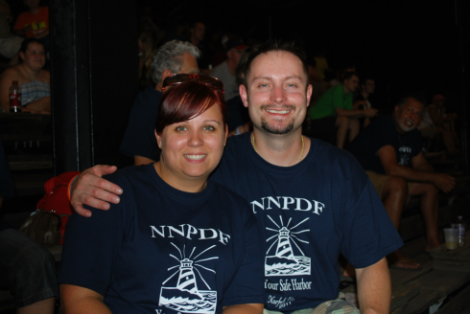 This year on July 28-30th the National Niemann Pick Disease Foundation (NNPDF) held their 19th annual Family and Medical Conference in Norfolk, VA. It was a great location in a naval town right on the bay! Me and Jennifer were able to attend for the first time since we learned of Brisan and Parker's diagnoses in August of 2008. The greatest benefit that we felt we received was the connection with other families putting that name with a face. Those are friendships that will run deep over a lifetime. As one parent who lost their daughter in March of this year said, “None of us in this room ever wanted to sign up to be in this club”. He said that exactly on the button! Meeting other kids and a few young adults with Niemann-Pick Type C, A & B, we felt some positiveness and some negativity in the room. Honestly not everyone is able to be chipper 24/7. We were able to see first hand what different stages of NPC looked like. It kind of gave you an idea of what things may look as things progress more. It is so very true that you can not compare two kids the same age. The disease manifests itself so much differently which is the frustrating part for researchers and parents afflicted by this horrible disease. Another benefit was listing to an array of doctors/ researchers such as Dr. Marc Patterson, Dr. F. Denny Porter, Dr. Dan Ory, Dr. Fran Platt, Dr. Steven Walkeley, and a few more talk about different areas they are researching but more importantly the collaboration they all partaking in. An upcoming beginning trial of Cyclodextrin in 2012 at the NIH is in the works of coming to life. Some of you reading this have heard about this sugar compound that has shown great use of removing cholesterol out of the cell. Albeit they don't fully understand why it does that, this could be a good insight into Niemann-Pick Type C as a whole. Dr. Porter carefully went over how they planned to administer Cyclodextrin and cautioned us that there are unknowns that can pop up during this beginning phases of an official trial. The families that attended were beyond wonderful people. Having NPC, NPA or NPB is not a disease that you would pick if you had to pick one.. you know? There are some immaculate people that showed immense courage to be there, wake up every day to love their loved one, and show they are not going to let this death sentence ruin our time here on earth! Our hearts go out to everyone we met affected by Niemann-Pick Disease. The reality of it all is extremely sad and brutal on your emotions.